In case you missed the memo, velvet everything is a must have this season. From tops and dresses, to shoes and handbags, the smooth material is one you want to add to your wardrobe, and I'm loving it. Not only do I find velvet super soft and cozy to wear, but it gives off the cool girl vibe that I love, and adds a fun texture to your outfits. Not to mention, it makes a perfect look for the holidays. 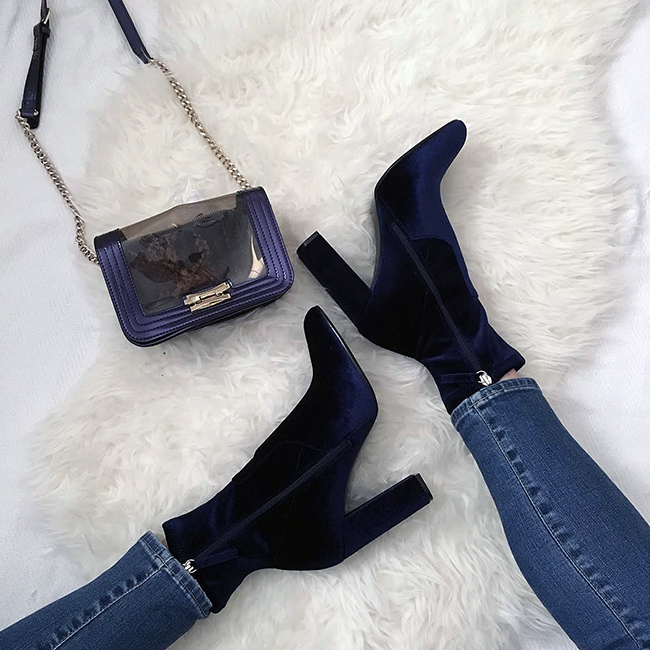 I just added these blue velvet booties to my wardrobe, and already have so many outfits planned around them. They are such a great price, at under $90, and a perfect alternative to the few designer booties that I have been crushing on (here and here). One of my favorite ways to add velvet to my wardrobe is with a coat or blazer, and I have owned this velvet blazer for years. It's such a classic piece that I keep pulling out of my closet, and I'm thinking I should add this burgundy beauty to my wardrobe as well (which is also available in black). I love the idea of a velvet camisole or tank dress, especially for the holidays. How cute would this tank dress be for a party (I'm loving the lace detail on the back) or look layered over a turtleneck for Thanksgiving dinner? And don't even get me started on this velvet jumpsuit. Simply amazing! If you're not ready to drape yourself in velvet, adding an accessory is the best way to try the trend. Finish your look with a velvet handbag or choker to get that cool girl feel. That burgundy velvet dress is absolutely a show stopper! I am all about the velvet trend just need to find one that works for me! I love them the most at shoes! My dear, the first photo is beautiful. I just loved the combination of velvet boot with incredible jeans. It is a simple, common one, and a pretty normal pants, but I loved. It was very beautiful, especially with the boot. Congratulations for the post! 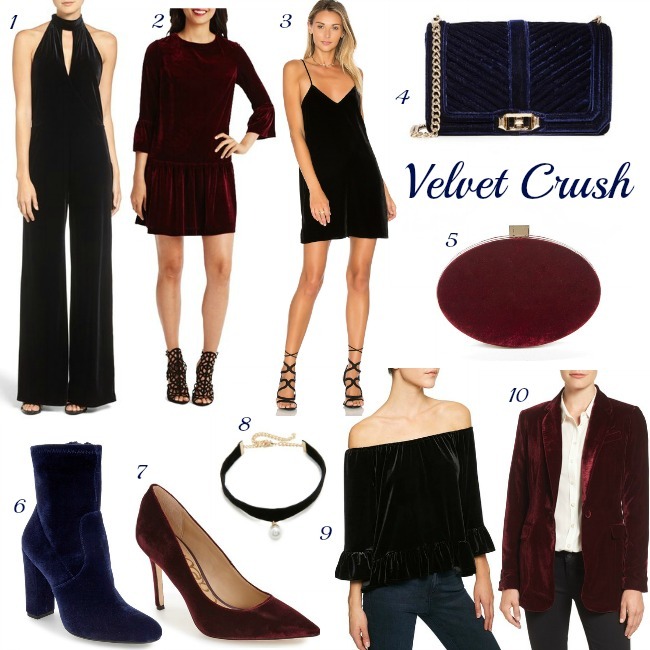 I am crushing on velvet this season! I love all the fun velvet shoes! Those burgundy heels are gorgeous! Love your velvet shoes. So beautiful! Those shoes are amazing. I saw them on your instagram! Also obsessed with the blue Love bag! Have a wonderful weekend! I definitely need some of this velvet in my life!